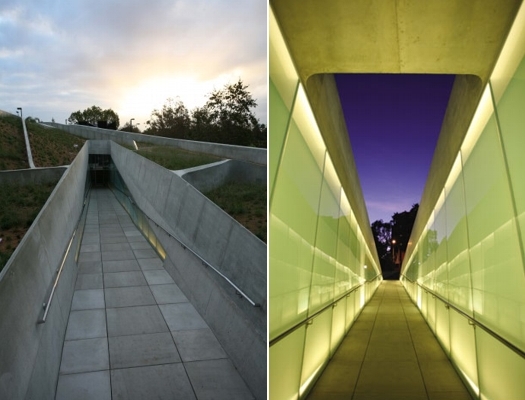 LA's newest museum is the permanent home for the Holocaust Museum, a 50 year-old institution. 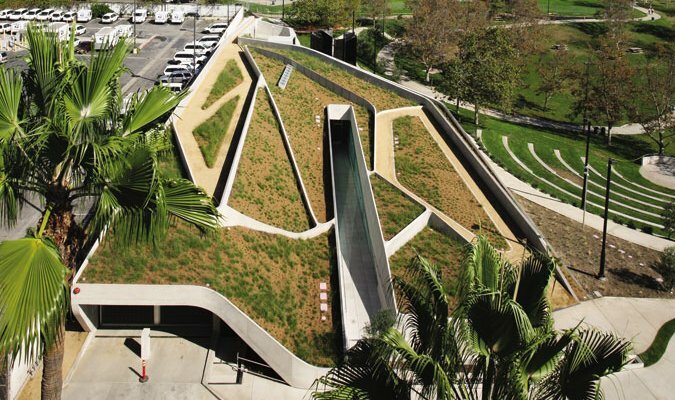 The striking building designed by Belzberg architects features a generous green roof that acts as an extension of the adjacent Pan Pacific Park. The project was also designed to express one of the darkest moments in human history - a buried organic form greets visitors as they descend into a unique museum space that memorializes those who died and survived the holocaust. The museum just opened this week in a lot adjacent to the Holocaust Memorial placed in 1992. The LAMH is the oldest holocaust museum in the US and this is its fourth and final location. Its subtle design is meant to blend in with the park, offering a public open space. The exterior is very gracious, featuring a green roof with a series of walkways pressed into its undulating shape – pedestrians may not even be aware when they are on museum grounds. The entrance is subtly placed as a long descending corridor, splitting the body of the building into two. Windows on either side of the descending entrance let light into the heart of the space. The spaces are designed with lowered ceilings and lighting as the embedded rooms tell the story of the Jewish experience as the war unfolds. 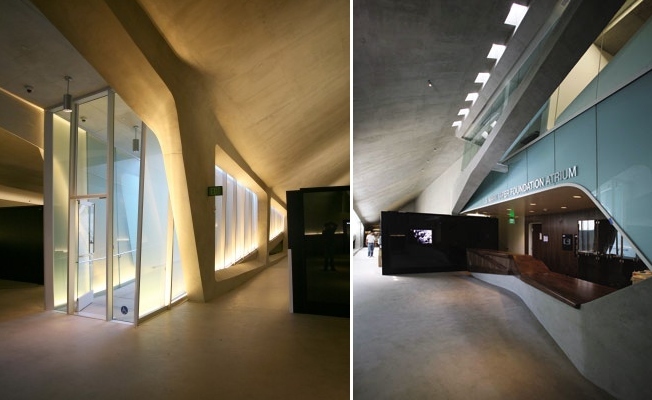 The provocative undulating concrete forms are evocative of bones, creating a somewhat chilling dialogue with visitors. The architecture plays with natural light in the lobby and core of the building, then gives way to low-intensity artificial lighting the further you go into the 32,000 square foot space. As visitors go through the purposely oppressive rooms, they finish in a naturally-lit filled space as the liberation ending the war is unveiled. The museum just opened this week on a site adjacent to the Holocaust Memorial placed in 1992. The LAMH is the oldest holocaust museum in the US and this is its fourth and final location. Its subtle design is meant to blend in with the park, offering a public open space. The exterior is very gracious as pedestrians may not even be aware when they are on museum grounds. The green roof has a series of walkways pressed into its undulating shape. The entrance is subtly placed as a long descending corridor, splitting the body of the building into two. Windows on either side of the descending entrance let light into the heart of the space. The reception area is a unique mix of natural light and undulating forms. The provocative undulating rounded concrete forms are evocative of bones, creating a somewhat chilling dialogue with visitors. The architecture plays with natural light in the lobby and core of the building, giving way to low intensity artificial lighting the further you go into the 32,000 square foot space. As visitors go through the purposely oppressive rooms they finish in a natural light-filled space as the liberation ending the war is unveiled.